This page details the different QQI Activities on the site, and what each of them does. There are 6 different activities available for each topic, and the full index of activities is available here. All the activities make use of a random function that creates random questions for students to practice the skills they learn in class, and also provide answers so students can check their work. Some are intended for use in class, whilst others for use at home as extra practice. The ﻿QQI﻿ activities are the original random question generators created for ﻿www.interactive-maths.com﻿. They are designed to generate random questions on the given topic, whilst also giving lots of flexibility as to the options you choose, hence making them usable with a whole range of abilities and classes. They are designed to be used at the front of the class, ideally with Mini-Whiteboards, to quickly ascertain the level of understanding of each student in the room before moving on. They also give the correct answer to the question they produce, saving teachers time having to work them out. They can also be used at home, on any device, as there is a box for students to enter their answers before checking them. 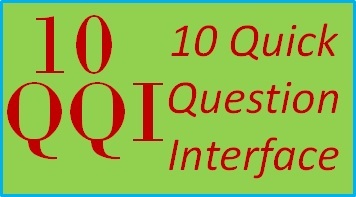 The 10QQI activities are very similar to the original ﻿QQI﻿ activities, but instead of producing a single question at a time, they generate 10 random questions on the given topic. With the same options, these are ideal for students to revise important skills, and make a great starter to recap prior knowledge. They can also be set as a homework, as students must enter their answers and then have them checked. They could then "print screen" their completed answers and stick it in their book or email it to you to check. They get instant feedback, you save time on trivial marking, and every student has different questions (no copying possible). These have a feature to show the correct answers (good when used as a starter), but when the answers are shown, pupils cannot edit their answers (so they can't cheat). The ﻿﻿﻿QQI Count Down﻿﻿﻿ activities produce one question at a time, and give you a set amount of time to answer the question before the next question appears replacing the previous one. They have the same options as the other activities, along with choosing how many questions you would like, and how long each should appear for. A countdown timer will show for each question, so students know how long they have. These are ideal as starters to lessons as the students have to focus immediately to answer the questions in the time frame. Get students to write down the answers to the questions in their books, and at the end, the questions and correct answers are revealed to the class so they can check how they did. 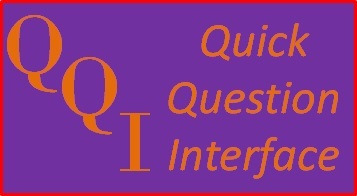 The ﻿﻿﻿QQI Relay﻿﻿﻿ activities produce one question at a time, and you must input the correct answer before being able to proceed to the next question. They are designed for students to use on their own device, either in class or at home. ​Students can only move to the next question when they have successfully answered the current question correctly (or had 4 incorrect attempts). They are awarded points depending on how many attempts they need to answer each question: 3 points if correct on the first go; 2 points for the second go; 1 point on their third attempt; and 0 points on the fourth attempt. This requires accuracy to gain maximum marks. Ideally, this is set as a competition within the lesson, and the pupil with the most points wins. If two pupils have the same number of points, you can look at the times it took them to complete to decide. 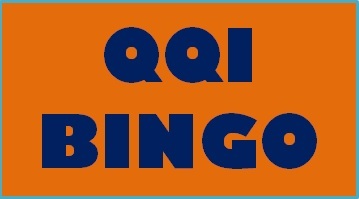 The QQI BINGO activities are designed to use as starters or plenaries with classes, and do not come in a mobile friendly version. It is the classic bingo game, where students draw a 3 by 3 (or 4 by 4) grid, and populate it with answers from those given by the activity. Then, the questions are generated in a random order (but each giving one of the answers from the original selection table), and students must answer the question in order to be able to cross off answers in their bingo grid. ​Ask a random student to give the answer to each question, so they have to all be working it out. If they have the answer, they cross it off, and the first to cross off either a line or a full house shouts "BINGO!" to win the game. You can then either carry on playing until all questions are done, or finish the game, and all the questions with correct answers will be revealed. ​There is also a QQI BINGO Generator, where you can insert your own questions, including images, to create your own bingo game very easily. It is possible to save the game so you can reload it at a later date (see this blog post for more information). The standard Worksheet, with as many as 100 questions. Choose how much working space you want to provide (Very Small fits 30-40 questions per page, Small fits 20-30, Medium fits 16-20, Large fits 10-14 and Very Large fits 4-6), and give the worksheet a title. I like to use these as a "How Many Can You Do" style activity, where I give students 10 minutes to do as many as they can. They could also be used for relay races (like the ﻿﻿﻿QQI Relay but paper based). The answers for all the questions are printed on a separate page at the end. The Treasure Hunt option produces a set of treasure hunt cards for placing round the room or to be used as a set of loop cards in small groups. You can choose how many cards there should be (from 4 up to 40 in multiples of 4), and how many cards there should be per page (either 4 medium sized cards or 1 large card). The answers to each individual card are supplied as is the correct loop based on the card numbers. These are a classic engaging task that students enjoy. As with QQI BINGO there is a Treasure Hunt Generator where you can easily make your own Treasure Hunt including images (see this blog post for more information). The Odd One Out activity is based on an excellent resource found on TES uploaded by UKDana. There are 16 answers in a grid, and 15 questions given. Each question matches with one of the given answers, leaving one spare answer at the end, the odd one out. This makes it an excellent starter as it is very easy to check answers (did students find the correct odd one out). An extension is also provided to find as many questions to give the final answer as possible. As always, full answers are provided if you need to check each individual question. The Codebreaker activities are always popular with students. There are 26 questions, each with a different answer that links to a letter of the alphabet. Students then use these answers to decipher a message at the bottom of the page, which could be a maths joke, a general joke, or a wise/motivational quote. There is also the option to use your own message, so you can personalise it to your class! The answers to each letter are provided, as well as the full message. If you have any good jokes/quotes that would work well (they need to be fairly short), then please Contact Me.